This is The Digital Story Podcast #534, May 31, 2016. Today's theme is "Your Go-To Portrait Set Up." 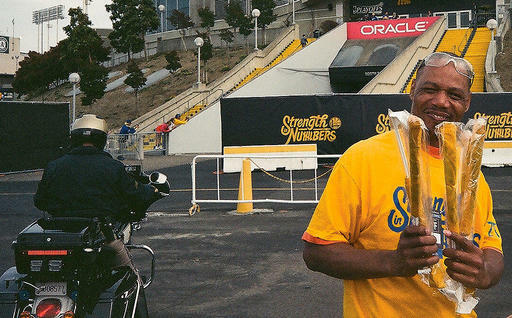 I'm Derrick Story. I just joined Linkedin a couple weeks ago as part of my work with lynda.com. I love the site and seeing what former co-workers are up to. One thing about it that has made me smile is how many of my portraits are being used as profile shots. Many of these were done with my "Go-To Set Up." And that's what I'm going to lead off with today. Many of the portrait shoots that I do are for friends, co-workers, and business associates. Often, these are not formal affairs. The subject feels like he or she is having a good hair day and likes the attire they are wearing, and the timing is good for a headshot. 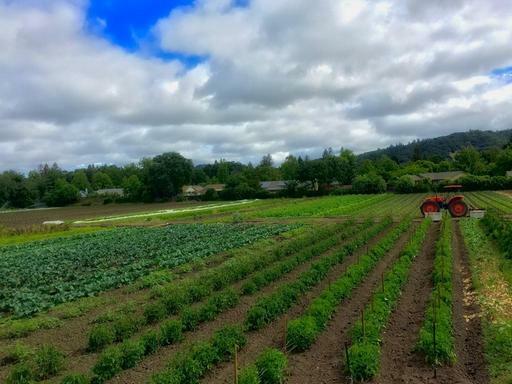 As a result of these requests over the years, I've developed a quick go-to approach that can accomplish the task in about 10 minutes, but yield excellent results. I thought that I'd share my approach with you today, so you can create your own. Believe me, you'll use it often. Camera and Lens: My favorite combination is the Olympus M.Zuiko Digital ED 40-150mm f/2.8 PRO ($1,399) mounted on my Olympus OM-D E-M5 Mark II. If that lens isn't in my bag at the moment, anything between 90mm and 150mm will work great. Fill Light: I've really taken a liking to the 32" ExpoImaging Rogue Collapsible 2-in-1 Reflector. The white side reflects a soft, natural light, and the silver is the best silver coating I've seen: not too hot, but adds a good sparkle. If you don't have an extra set of hands to hold the reflector, you can have the subject do so since this is a head shot. Pay attention to the position of the shoulders if you go this route. RAW+Jpeg: I consider this an essential part of the shoot, especially for women over 40. Why, because I use the Soft Focus Art Filter on the OM-D. That gives me a Jpeg with the effect applied, and if it doesn't work, I use the RAW file. BTW: set the Art Filter through the Super Control Panel using Picture Mode. This approach gives you far more control. Hair Light: Typically, I find a spot outside in open shade. I like to position the subject so some light is falling on the hair, using the reflector to fill in face. Hair lighting adds a real professional touch to the image. Body Language: Remind the subject to keep their weight on one foot of the other, never flat-footed. Encourage them to stand straight with good posture. If possible, have the arms slightly bent at their sides. And position them so their body is facing off-camera with their head turned toward the lens. Post Processing and Delivery: Make sure the white balance is a pleasing skin tone. Don't over edit the photo. You want the person to look like themselves, but on a good day. 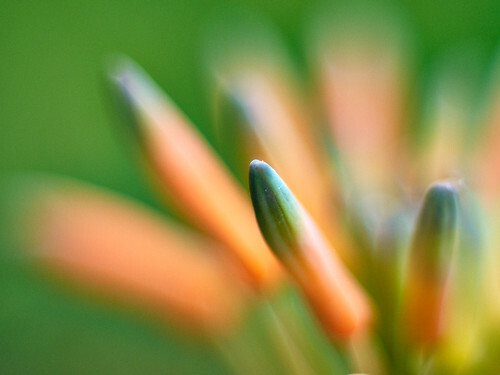 If you do go with the softening filter, sharpen the image back up in post with clarity and edge sharpening. You'll still get the benefits of the filter without the image looking overdone. Deliver a handful of favorites online and let them download the ones they like. How to Figure Out What Light Modifier To Use as reported by the Phoblographer. Many photographers just getting into working with light specifically are often very confused about what light modifiers to use. But they're also never quite sure what they should use for the type of work that they're doing. The true answer is that everyone is making good stuff these days and that very few people will be able to look at an image and immediately tell what light modifiers you're using in the same way that they won't be able to tell your camera, lens, etc for the most part. Instead, it's all about the type of photo that you're trying to create. I've been testing the Think Tank Retrospective 7 for my urban shooting, and here's what I're liking about it. Size - It's big enough for any of my mirrorless kits without creating a nuisance in crowded environments. Materials and Design - Love the fabric and craftsmanship. Collapsable but Sturdy - It really holds its shape well in use. But the bottom panel folds upward so I can pack the Retrospective in my suitcase for travel. This is the bag I'll be using for my Photo Walks at the Out of Chicago Conference next month. Great Pocket Organization - The double front pocket arrangement is amazing, but all of them are spot on. Sound Silencer System - To velcro or not, the choice is yours! I have a Think Tank Photo tile on all the pages of The Digital Story. If you go over there to look, please use the link I provide in the article, or the advertising tile. All TDS listeners will receive a free gift with their order and free shipping. Have you been waiting for great prices on a new mirrorless camera? Olympus has just announced their Summer Sale, and you can save between $100 and $200 on a great body. The Olympus OM-D E-M5 Mark II drops from $1,099 to $899 for a limited time during the sale. 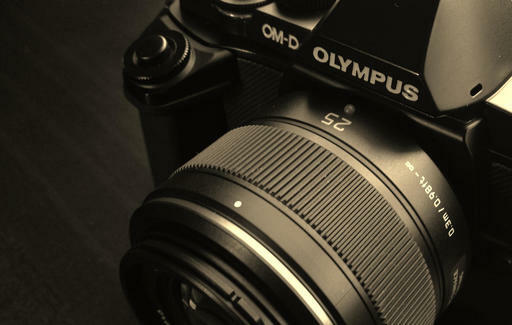 The Olympus OM-D E-M1 also drops $200 to $899. This is a great camera, but my word of caution is that I think it's soon to be replaced by the Mark II. So if you want the latest and greatest, you may want to wait and see what happens with this model. And finally, the Olympus OM-D E-M10 Mark II drops $100 to $549. These are all body-only prices, but it looks like there are really good lens bundle options that reflect the same degree of savings. So if you need an optic too, I'd look into those. In terms of what cameras are going to get refreshed next, my guess is that we'll see a new E-M1 Mark II before the end of the year. After that, a possible E-M5 Mark III in 2017, but that's no sure thing because the Mark II is so good. 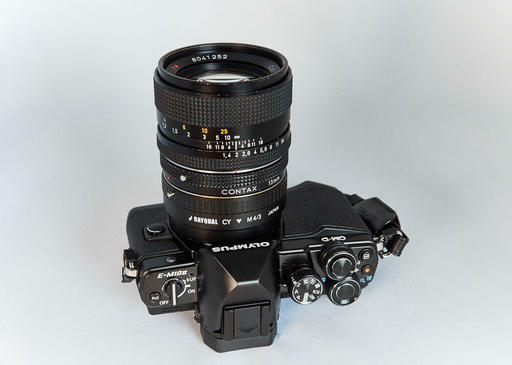 And I don't think we'll see an immediate refresh on the E-M10 either, at least not in 2016. 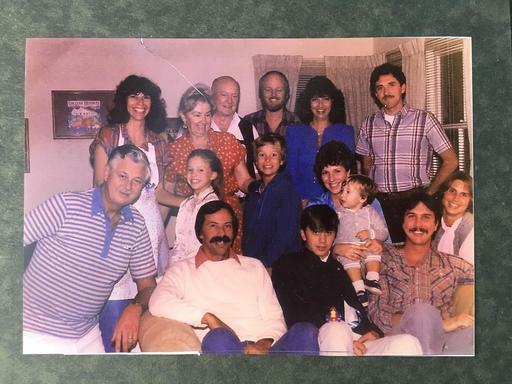 I have my share of old family prints that I'd like to digitize. So I decided to give Unfade for iOS ($4.99) a test with my iPhone 6S. It's easy to use and does a reasonable job of helping us move prints from the shoebox to our favorite social network site. For the first image, I captured the shot using the built-in camera app for the iPhone. The second image was recorded with Unfade. No additional retouching was applied to either shot. This is how they came out of the camera. 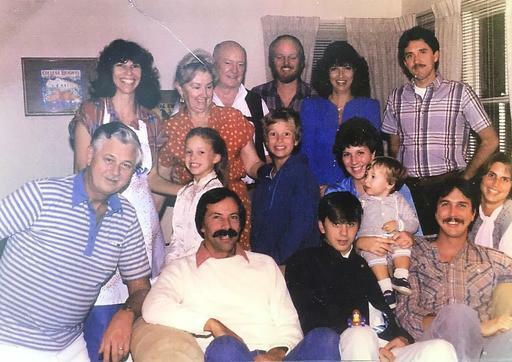 By the way, that's me in the lower right corner with the mustache. Unfade did remove some of the magenta tint and improved the overall skin tones. Plus it automatically cropped the image for me. The app is easy to use and allows for sharing via the usual suspects, including your Camera Roll and social network sites. Is it a good investment for $4.99? I'll leave that to you. But I'm glad I have it, and I will probably use it regularly for quick scans of old photos. Take a look at theAnalogstory - Film Photography in the Digital Age. We cover great 35mm cameras, personal stories from film photographers, quick tips, and even a camera shop. Stop by, won't you? I've just finished testing Aurora HDR Pro 1.2.2 standalone app and Editing Extension for Photos for OS X, and this version includes some terrific enhancements plus additional RAW compatibility. "Red Tractor" - Captured with an iPhone 6S and processed in Photos for OS X using its editing tools and Aurora HDR Pro Editing Extension. Image by Derrick Story. To complement all of the powerful slider tools, there are dozens of presets to help you get your image on the right track. 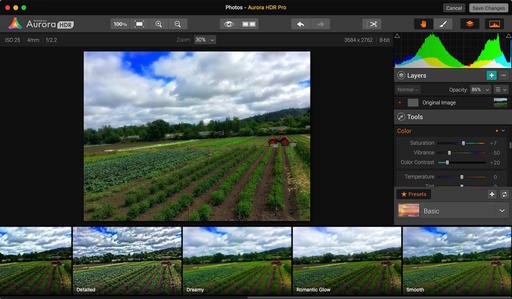 Aurora HDR Pro is a wonderful Editing Extension for Photos for OS X. In addition to being a robust HDR processor, the software includes many advanced sliders such as Top & Bottom Lighting, Tone Curve, Layer Control, and Denoise. Plus, it features seven categories of presets, which is a great way to figure out the starting point for your editing. You can get $10 Off Aurora HDR Pro plus receive $90 worth of bonuses here. Having the ability to store all of our images using the 1 TB of free disc space available in Flickr, it's only natural that we'd want to share some of those images too. You can easily mark a single shot, or a group of images, to share, regardless if they are public or private. I often keep pictures from a portrait shoot private (Camera Roll only) in Flickr, then send the proofs to the subject for approval. Once they've indicated the shots they like, I can mark those as public for the world to enjoy. 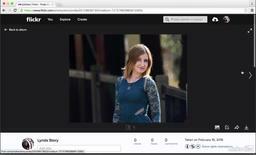 Here's a short movie that shows you how you can be in complete control of your sharing via Flickr. If the movie doesn't load in your browser, you can link to it here for viewing. Talk about a beautiful convergence of the analog and digital worlds. For my morning photo shoot, I mounted a Carl Zeiss 50mm f/1.4 (Contax/Yashica mount) on to an Olympus OM-D E-M10 Mark II and added a Contax 13mm close-up ring in-between to photograph flowers around my studio. I wanted two things from this shoot: as shallow depth of field as possible and no tripod. I got both with this combination. The Zeiss 50mm is one of my favorite optics to adapt to the OM-Ds. I've been using a Rayqual Mount Adapter to fit my Zeiss primes on to the Olympus digital bodies. The system works great thanks to the amazing image stabilization in the OM-Ds. I set the aperture on the lens, put the mode dial in the "A" position, and start shooting. It's that easy. The OM-D provides the correct meter reading and image stabilization. Plus, I have the EXIF metadata for everything but the aperture setting, which I mentally note, then add later. I then load the RAW files into Capture One Pro for a little fine-tuning, then output. The reason why I like this approach, is because I want to create images that have a painterly feel to them, and this convergence of analog and digital provides just that. Stop by the for all things film, SLR, Polaroid, and rangefinder. It's a blast from the past. 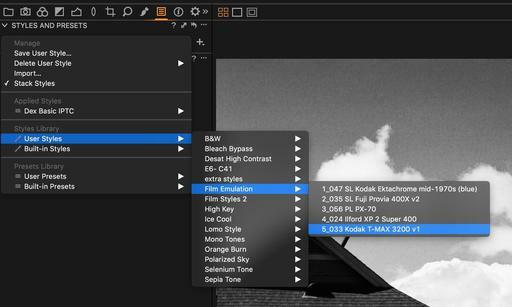 Can Capture One Replace Your B&W Plugins? One of the reasons why I continued using Aperture after Apple ceased development, was because I was fond of the plugins I had acquired for it. As I became more familiar with Capture One Pro, however, I learned that I might not be giving up all that much after all, especially for Black & White photography. Two reasons for that: 1) The Black & White converter image adjustment, and 2) Styles presets. The adjustment sliders for B&W conversion are very good. But the kicker is all of the presets loaded in to the application. So you can browse the different looks, pick one you like, and then fine tune from there. Here's a video on how that works. 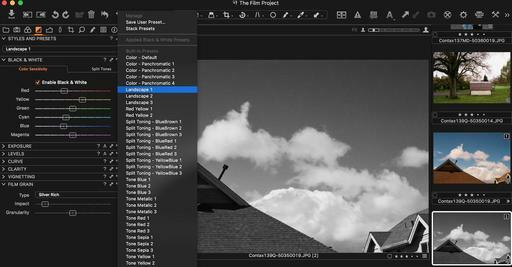 As a finishing touch, take a look at the Film Grain tool. There are a variety of great effects there, including my favorite, Silver Rich. There are also some wonderful commercially available Styles that you can download, such as Capture One Styles that load a variety of effects right in to your application. The nice thing about these is that they don't disrupt the RAW workflow. My previous Aperture plugins required that I converted files to TIFFs and then roundtrip them. With Styles, everything stays in RAW and in the host application. 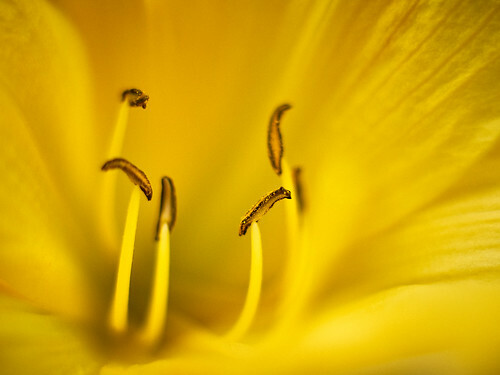 Thanks to these features, I'm discovering that there is indeed, life after Aperture plugins. 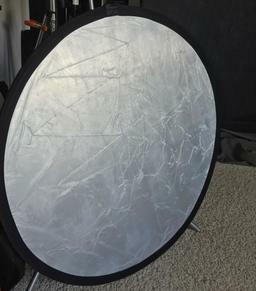 Honestly, I've been waiting a long time for a reflector like this. And maybe one existed, and I just didn't know about it. But now that I have the Rogue Collapsible 2-in-1 Reflector, I've added another missing piece to my portrait work. What's the difference between the Rogue and every other collapsable reflector? It's the super soft silver side that provides a crisp contrast without being too hot. So when using it as a fill light, you get enough pop to make a difference without blowing out the highlights. On the other side features a traditional natural white reflector, which is always good to have for more subtle fill. The natural white reflects a neutral tone instead of the bluish tints that I've see with some cheaper models. Plus the white can also be used as a background in a pinch. That being said, I think it's the silver side that I think most photographers will be using. The Rogue 2-in-1 expands to 32" diameter; a nice working size that isn't too big to hold by hand, yet provides ample lighting. It folds down to 11.5" in diameter, so it will easily fit in most backpacks and lighting bags. Both the included case and the reflector have hanging loops. And all the materials are high quality that you can feel. One difference with the Rogue, as a result of these quality materials, is that it will not work as a diffuser. In order to produce the right contrast for the silver side, the fabric is coated to create the softening surface. So if you do need diffusion, I would also pack one of your thinner white collapsables. The Rogue Collapsible 2-in-1 Reflector is available for $29.95. It's a terrific photo accessory for portrait photographers. 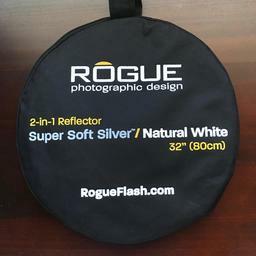 The Rogue Collapsible 2-in-1 Reflector has a high Nimbleosity Rating. What does that mean? You can learn about Nimbleosity and more by visiting TheNimblePhotographer.com.